October 07, 2014. KDE today announces the release of KDE Frameworks 5.3.0. Kdelibs4Migration: allow distributions to set KDE4_DEFAULT_HOME_POSTFIX so that the kde4 home is found properly. Add new KIO job, KIO::fileSystemFreeSpace, that allows you to get a filesystem's total and available space. Fix thumbnails for mimetype groups. Avoid infinite recursion in KStatusNotifierItem / QSystemTray. NETWinInfo now provides convenient wrapper for WM_PROTOCOLS. NETWinInfo now provides convenient wrapper for input and urgency hints of WM_HINTS property. New module ECMGeneratePkgConfigFile, for frameworks to install a pkgconfig file. New option BUILD_COVERAGE, to enable code coverage. Building from source is possible using the basic cmake . ; make; make install commands. For a single Tier 1 framework, this is often the easiest solution. People interested in contributing to frameworks or tracking progress in development of the entire set are encouraged to use kdesrc-build. Frameworks 5.3.0 requires Qt 5.2. 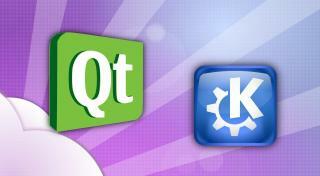 The complete source code for KDE Frameworks 5.3.0 may be freely downloaded. Instructions on compiling and installing KDE Frameworks 5.3.0 are available from the KDE Frameworks 5.3.0 Info Page. A detailed listing of all Frameworks and other third party Qt libraries is at inqlude.org, the curated archive of Qt libraries. A complete list with API documentation is on api.kde.org.